Cilia are microscopic tube-like structures that protrude from cell walls. These finger like projections can assist in the movement of cells throughout their environment, and in some instances assist with the movement of fluids around the cells themselves (this is how mucus moves up and out of your trachea). Insights into cilium development can assist in treating various human disorders, but little is known about this process. Fortunately, a recent graduate of the University of Scranton, Matthew Reynolds, was interested in characterizing just this! Figure from Reynolds et al. 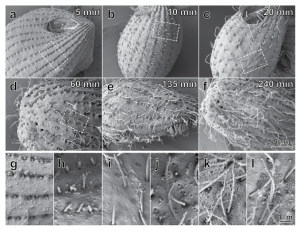 (2018) showing the development of motile cilia. Images were taken using scanning electron microscopy. Matt worked in the Gomez lab at the University of Scranton ever since his Freshman year in 2015. During Matt’s summers, he worked with the Wadsworth Center at the NY State Department of Health. 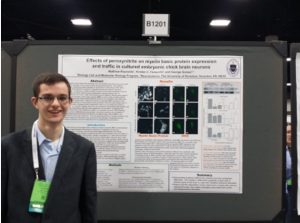 Together with Dr. Gomez and his colleagues at the Wadsworth Center, Matt began to investigate the development of motile cilia in the summer following his Sophomore year (2016). Over the next couple years, Matt and his colleagues conducted an extensive examination of the motile cilia formation using electron microscopy and complex image analyses. Matt’s research supports previous findings on cilia development, but expands upon our knowledge of maturation times for developing cilia. Whereas it was previously thought that cilia structures matured once the cilia reached their full length, it is now known that structures continue to change and mature well after the cilium itself has reached its full length. For more information on this study you can read the entire article which was published May 2018 in Scientific Reports – Matt was first author of this article! Matt presenting some of his earlier research that was conducted in the Gomez Lab. This entry was posted in Alumni Spotlight, Student Publications, Student Research. Bookmark the permalink.